This paper presents an analysis of the multi-sectoral and distributional economic impacts of rainfall shocks in the Awash river basin in Ethiopia. Using novel disaggregated data on crop production, we estimate the direct impacts of rainfall shocks on agriculture and then use a Computable General Equilibrium model to simulate how these rainfall shocks propagate through the wider economy of the basin under three different climate change scenarios. The basin's economy and expanding agricultural sector are highly vulnerable to the impacts of rainfall shocks. A rainfall decrease scenario could lead to a 5% decline in the basin's GDP, with agricultural GDP standing to drop by as much as 10%. All sectors benefit from greater rainfall amounts. Distributional impacts depend on income group, with poor households accruing greater benefits relative to non-poor households under a scenario of additional rainfall and suffering proportionally lower income losses under a scenario of rainfall decrease. This article was published Open Access in Ecological Economics. Full citation: Borgomeo E., Vadheim B., Woldeyes F. B., Alamirew T., Tamru S., Charles K. J., Kebede S., Walker O. (2017). 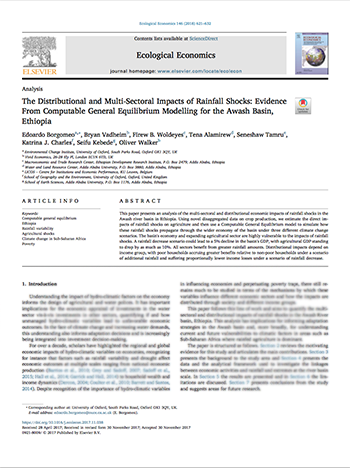 The distributional and multi-sectoral impacts of rainfall shocks: Evidence from computable general equilibrium modelling for the Awash Basin, Ethiopia. Ecological Economics, 146, 621-632.